The air-defense radar AN/FPS-117 (in Germany: RRP-117; Remote Radar Post) is a D-Band radar system in solid state technology. It consists of a primary radar, a secondary radar and a subsystem for simulation. The AN/FPS-117 provides 3D- target information in real time over the whole range of detection correlated with the replies of the secondary radar. It uses a phased array antenna turning within 5 rpm (in Germany: 6 rpm) and an electronically steared beam in elevation. In condition of the using of solid state transmitter modules the radar works with the pulse compression to reach a better range resolution nevertheless the relatively long pulsewidth. But that is only half the truth: during the transmitting time the antenna is busy and the receiver cannot work! If the pulse width of the transmitter is e.g. 800 microseconds then the receiver can work from 800 µs ·150 m= 120 km. The possible pulse width is limited therefore and the most radar sets use alternating a shorter pulse as the so called “short range mode”. The peak power is the same as by the long range mode. The shorter pulse make the energy balance weaker and so the radar set reaches a lower maximum range as by the long range mode. 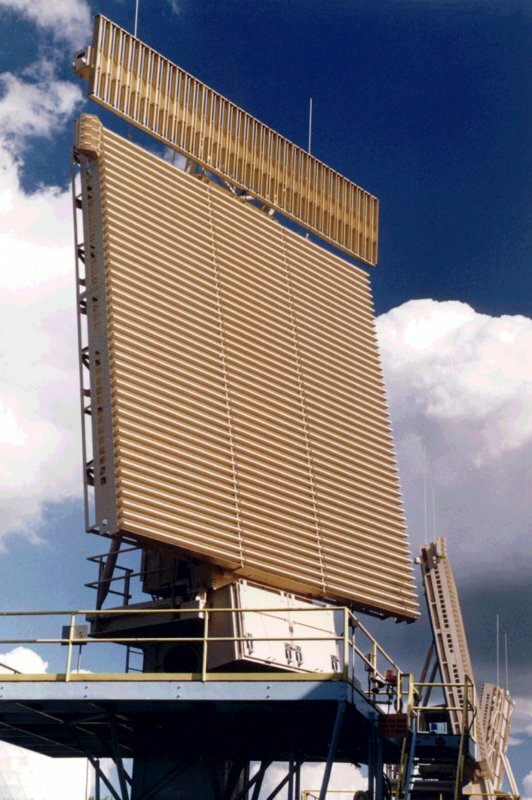 AN/TPS-77 (formerly known as the AN/TPS-117) and AN/TPS-59 are mobile variants of Lockheed Martin's “117” radar family.